Anti-LeY [BR96], Human IgG1, Kappa | 貨號Ab00492-10.0 1 mg/ml. LeY(Lewis Y.) tetrasaccharide四糖是選擇性癌細胞表面表達的carbohydrate antigen碳水化合物抗原，包括colon結腸癌，breast乳腺癌，ovary卵巢癌和lung肺癌。研究表明，單克隆抗體對抗原陽性腫瘤細胞具有toxic effects毒性作用，在濃度低至0.1μg/ ml時進行ADCC（抗體依賴的細胞介導的細胞毒性作用，antibody-dependent cell-mediated cytotoxicity，ADCC）。抗體B396在某些癌細胞系中以0.1-5.0μg/ ml的濃度進行補體依賴性細胞毒性。單克隆抗體還具有被抗原陽性腫瘤細胞內化的能力，因此可用於將抗癌藥物遞送至特定腫瘤細胞。Lewis Y.抗體其免疫原由人乳腺癌轉移建立的H3396培養系，由Protein A affinity方式純化於PBS with 0.02% Proclin 300.緩衝Buffer。特異性：抗體以0.1μM的Ka結合Le（Y）。貯存條件tore at 4⁰C for up to 3 months. For longer storage, aliquot and store at -20⁰C. Immunofluorescence staining of fixed Caco-2 cells with anti-LeY tetrasaccharide antibody BR96 (Ab00492) Immunofluorescence analysis of paraformaldehyde fixed Caco-2 cells on Shi-fix™ coverslips, permeabilized with 0.15% Triton and stained with the chimeric mouse IgG1 version of BR96 (Ab00492-1.1) at 10 µg/ml for 1h followed by Alexa Fluor® 488 secondary antibody (2 µg/ml), showing membrane staining. The nuclear stain is DAPI (blue). Panels show from left-right, top-bottom Ab00492-1.1, DAPI, merged channels and an isotype control. 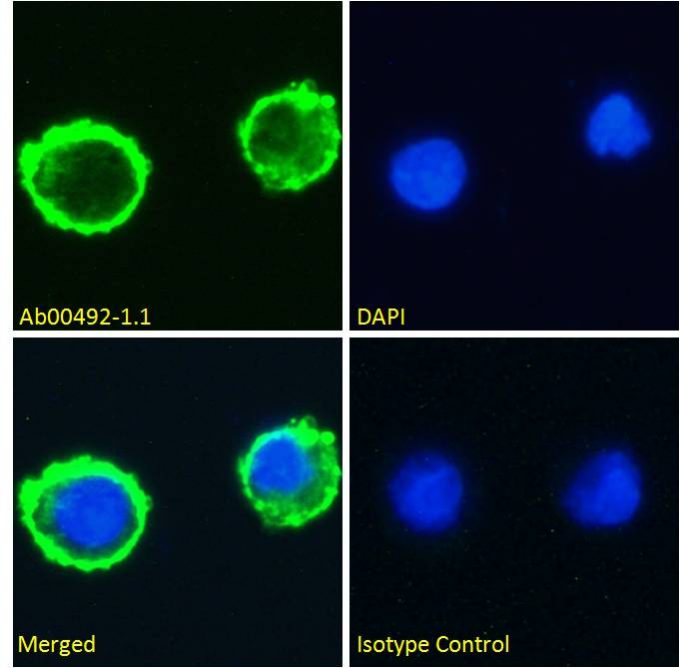 The isotype control was stained with an unknown specificity antibody (Ab00178-1.1) followed by Alexa Fluor® 488 secondary antibody.